It’s only been a few weeks since the flood waters wiped out the neighborhood including Faith Lutheran Church in Dickinson, Texas. While the church building is not yet open for worship, Pastor Deb Grant and her congregation aren’t waiting to respond to the needs in their community. * They have a vision, a vision that will help parents put books into their children’s hands this year at Christmas. The fact that all the books that had been donated for the community had been lost in the storm. The Ark Book Pantry is proof that the Holy Spirit is blowing through her congregation even as they wait for the city to get rid of the mountains of debris (this is what we call our furniture, drywall, and insulation after its been flooded) waiting on the front lawn for garbage pick-up. Yes, in the midst of the devastation, Faith’s leaders are already looking ahead to the holidays. They want to see books in the hands for their neighborhood children, and more than that, they are making it happen! 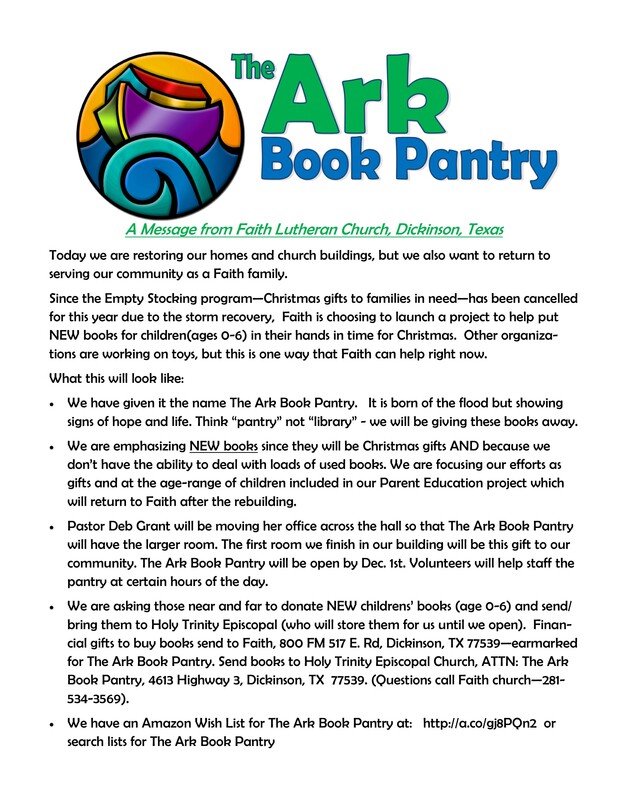 “Born out of the flood but showing signs of hope and life”, Faith is creating a book pantry, a place where new books will be given away to children, but that’s not all. It’s also a place to build trust in their neighborhood and support parents who are facing a host of challenges in the wake of the hurricane. The psychological toll of a natural disaster is predictable. There is a formula for forecasting the lowest point in the recovery process and in the emotional health of the community. For victims of Harvey, this coincides with the holidays. This is the time we can anticipate a rise in family violence, addiction, depression, suicide, and divorce. What helps is for people to feel supported, to get the resources they need, and to be reminded that God has them when everything else feels like it is falling apart. A book might not seem like much, but a neighborhood congregation that cares is life-giving. Buy books from the book list requested by the flooded schools in Dickinson. Build a book pantry in your own neighborhood. Increasing literacy is the #1 way to move people out of poverty. Parents who are not strong readers themselves can benefit from reading with their children. Books can change a child’s life as they expand their vocabulary, confidence, and vision for a world bigger than their own. On a side note, the ELCA Youth Gathering has invited everyone to bring books to Houston next summer. Stay tuned for more on that in a few months. Why not make this holiday a book-giving experience by partnering with Faith or another book distribution center, or by building one of your own? This is a great way to be a good neighbor. *Faith Lutheran Church in Dickinson is worshiping with Holy Trinity Episcopal Church each week, another neighboring opportunity.